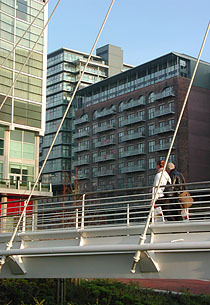 Trinity Bridge is a small, domestically scaled footbridge across the Irwell River in a densely built area of central Manchester. 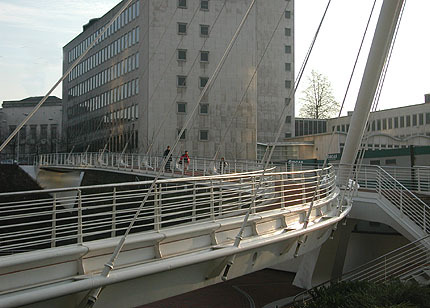 The single walkway from the Manchester side of the river forks in mid air on the Salford side, curving into a choice of ramped pathways up and down the river, with a third option of steps down to continue straight ahead. In the center of this fork is the single 41-meter pylon that supports the structure, angled dramatically towards Salford, away from the river crossing that hangs from it. 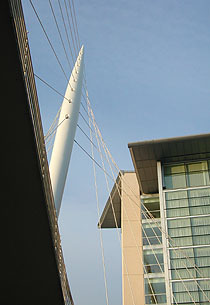 The three-dimensional geometry of the suspension cables, radiating from the sloping pylon to the three suspended pathways (the straight bridge and the two curved 'on-ramps') is ever-changing but continually pleasing as you walk across the bridge. 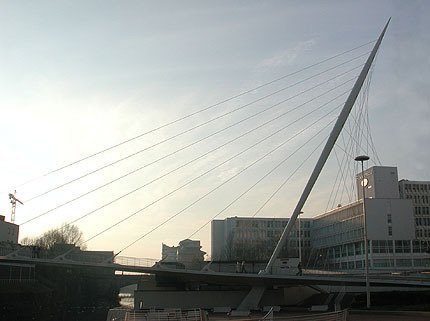 The bridge is near the center of Manchester, accessible from both Manchester and Salford. From Manchester on foot, head from Deansgate along Bridge Street towards the west. Turn right into St Mary's Passage, then left along the footpath by the side of Albert Bridge House (five minutes' walk). Nearest public parking is in Gartside Street; from the car parks head north up that street, turn right into Bridge Street, left into St Mary's Passage, then as above. From Salford, reach the bridge at the end of Brown Street, a turning off the A6 (Chapel Street) just east of Salford Central station.